The Hammersmith Flyover has reopened! Long live the Flyunder! Here at the Horton and Garton Hammersmith office, you could hear the sighs of relief from west London motorists as TfL reopened the flyover at the end of May. Around 200 metres of the central reservation was replaced, and the structure was strengthened so it can take increased traffic loads, say TfL. But if only it was that simple! The road will soon lose a lane thanks to the Olympics and the special ‘Games Lane’ for athletes, VIPs, and even a few dictators. And once the Olympics are done, TfL admits it will have to return to fully repair the crumbling elevated road sometime in 2013. So much for the good news! But if you dropped by Lyric Square last weekend, you will have seen some of London’s best architects discussing the radical flyunder plans, which could finally reconnect the river to Hammersmith town centre. The calls for a flyunder are not new. They have been debated ever since plans for the invasive road were tabled in the 1950s. After it was built in 1961, life was never the same in Hammersmith. Now with the road’s structural problems – caused by water leaking into the concrete and metal structure and corroding it – TfL is being urged by H&F Council, the Brackenbury Residents Association and architects from across west London to think big and dig! 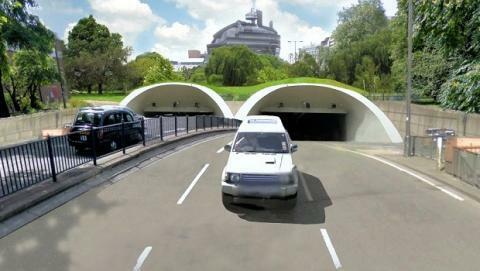 The calls for flyunder were further bolstered by the news that the renowned Brook Green-based Halcrow Group were throwing their support behind the scheme. You can see from their artist’s impression (above) that the tunnel – pictured with the Hammersmith Ark floating majestically over the structure in the background – need not be very long to be effective.